– The least PRO thing I’ve ever done took place on day 1 of my freshman year of college. It was a break-the-ice-type social event -- a chaste tie-dye party to which I took a classic mid-80’s Campagnolo T-shirt. It was a pure white shirt, apropos of the fact that especially back then Campy is Heavenmade. Haute Phish, the kaleidoscopic color with which I festooned what had once been a thing of beauty. It was a mortal sin of non-PROness matched only by the fact I actually wore it. Again and again. There’s a reason for the U23 category -- it’s not just about racing, it’s about life. Nevermind the fact I rode an incredibly sweet Gianni Motta frame all that year. U23 is never PRO, no matter what. – An article that makes me ashamed to sell powermeters. An article that reminds me why I don’t subscribe to the magazine anymore. An article written to refute the possibility that races are won & lost because of initiative, will, courage, or smarts. An article whose premise is pseudo-science, i.e. scientific data cited purely as a means to sell a product. In the case, what’s being sold is fiction as fact: That the Tour of California has a degree of difficulty to justifiably make it ‘the 4th Grand Tour’, a myth that -- if widely accepted -- would give VeloNews a vaster tableau upon which to sell gobs more advertising. – Can somebody point me to the Philadelphia International Classic prize list? It’s America’s best one-day road event, and was once America’s most lucrative. I have a sneaking suspicion that Tulsa Tough -- a trio of crits run on the same weekend in Oklahoma-- pays better. I’d love to confirm/deny. – Yet another vote of confidence for what’s probably the best bib shorts in the market. – What is he wearing under his jersey? – The best bike I’ve ever ridden is a Cervélo R3 SL. The geometry suited me; it seemed to handle lousy roads with ample shock absorption; it was astonishingly light; and it had plenty of stiffness, though I must say this with an asterisk -- for the year I rode it, I combined the frame with a set of surreally light Reynolds MV32C UL carbon clinchers, and I got some rear wheel flex (most evident through the sound of the rim kissing the brake pads on wet roads). The Canyon behaves in all the typical stressful situations -- high speed descents strewn with debris; crit cornering; no-hands clothing changes -- and while I’m sure it’s a function of well thought out geometry, one detail stands out above all others: The Canyon is built with a taller-than-expected headtube. With some work I could’ve achieved my Cervélo’s saddle-to-bar height, but nonetheless I just left my bar on the high side. While the fractionally-taller bar position made me feel less like Michele Bartoli, I found myself riding in the drops more comfortably than I’ve done since the quill stem era. I suspect the stable handling & precise steering of the Canyon is as much a function of my bar position as it is its overall nice geometry. If there’s one thing I’ll take from my time on the Canyon, it’s the upside of a higher bar. During peak efforts, the new naturalness I felt in reaching for the drops fed my sense of aggression and heightened my power. Ultimately it was a lesson on what it means to look PRO. In Chapter 1 of ‘Being Exquisite on a Bike’, a massive saddle-to-bar drop is fundamental. Yet setting up your bike in accordance with this might prevent you from frequenting your drops. What’s more PRO -- slammed bars, or spending bookoo time in the drops? I’d always appreciated the former, but now I’m buzzed about the latter. The matter of positional vanity gets even more interesting thanks to one critical design feature on the Canyon: It’s built with a 1-1/4′ headtube. While many bikes, like the Pinarello Dogma Carbon, are 1-1/4′ at the bottom headset cup then taper to a 1-1/8′ diameter at the top cup, the Canyon is pure 1-1/4′. This is worth mentioning because so few stem manufacturers make 1-1/4′ stems. Syntace makes the F119 -- but it’s an 84° stem which, when combined with the Canyon’s tall headtube, puts you too darn high. When you buy a Canyon it comes with a 1-1/4′ Ritchey WCS 4-Axis stem, also in 84°. If you choose the wrong size it’s a pain because Ritchey stocks no 1-1/4′ stems in the US, nor do any of their US distributors. 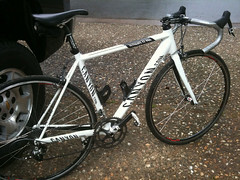 Canyon is the only place to get one -- a procurement headache since it must ship from Germany. 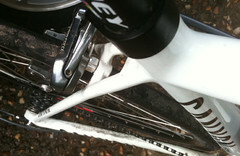 It’s a headache with a silver lining, though: Ritchey makes the same stem in a 73° rise, a.k.a. parallel to the ground, a.k.a. an angle otherwise extinct in the bike industry, a.k.a. a component so radiant with PROness that it doesn’t just obscure the tallness of a Canyon headtube but it makes the bike and its owner look molten hot thanks to the stem-induced illusion of a super-slammed bar. In truth the 73° stem + the tall headtube leaves your bar on the high side, but you’re aesthetically magnificent in getting there. A couple of final notes regarding the front end of the Canyon: It takes some time to get accustomed to the open top cap atop the fork. When you’re riding you look straight down into the steerer tube. Why is it like that? It’s a function of how little steerer reinforcement is needed. There is no headset compression plug required. Where does the water go when you get rained on? I haven’t seen it clog up yet, so I assume it drains out the bottom just fine. Even more unusual is the adjustment of the standard Acros headset. Unlike any other integrated headset, you first tighten down your stem bolts on the fork steerer, then you tension up the headset bearings by turning a screw in the upper headset cup that forces a cup above it into the bottom of the stem. Because of this, each time you adjust or change your stem, you need to readjust the headset. Perhaps the inconvenience is offset by a reduction in stress on the fork steerer, but I’m not completely sure and I’ll admit I’m still not completely used to it. From the standpoint of ride quality, the Canyon matches the best bikes I’ve ever ridden. Under power it doesn’t budge laterally, which in combination with its lightness makes it a fantastic climbing bike. At speed the sensations are the same: In sprints and short intervals there’s an essential solidity throughout. The 1-1/4′ headtube keeps the front wheel on its line, and the asymmetrical seat tube plus its chunky BB shell prevent the audible signifiers of flex: Rear wheel rubbing the brakes; chain brushing the front derailleur, etc. All the while, the smoothness of the Canyon is equaled only by the Cervélo R3. It’s no surprise the Canyon has the same wide, flat seatstays as the R3 -- a much-emulated design detail for vibration damping. Unlike the stalwarts of high-end frame manufacturing, i.e. Specialized, Trek, Cervélo, Pinarello, Cannondale, etc, Canyon has chosen a hyper-simplified way to sell their bikes: Consumer-direct on the internet. They have no 3rd party importers, 3rd party distribution, or even brick & mortar retailers. Rather they engineer & design the bikes in-house in Germany; they’re manufactured in Asia; they’re shipped back to Germany for QC & final assembly, from which Canyon’s in-house sales team (and website) sells them. The multiple layers of markup required to sustain a traditional bike industry flow of commerce, i.e. manufacturer to distributor/importer to retailer to consumer -- these layers are non-existent. Because of this, the Ultimate CF Pro sells for an unthinkable price. At the beginning of the season it was €1199. It’s now on sale for €899. Given the collapse in the value of the € vs. the $, it means that the frame, fork, headset, stem, and seatpost retail for $1125 -- a third of the cost of an R3, and a fifth the cost of a Dogma Carbon. Canyon doesn’t make their bikes available in the US, but inevitably that day will come. Given their prestigious brand positioning in Europe; their top-scoring results in various magazine tests & shootouts; and their commanding marketshare in Europe, their eventual impact in the US market is assured.